High school students who get average grades and don’t ace the SAT or ACT discover that an exceptional college education is by no means beyond their reach with this guide. 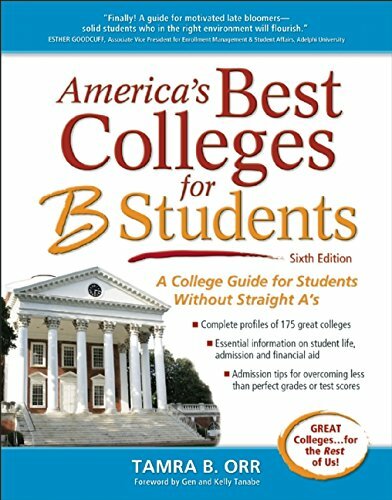 Along with information on what to look for in a college and what colleges look for in their students besides grades, this college reference provides details on more than 175 colleges that make it a point to help students who have not achieved a stellar GPA and includes information on whether colleges feature extra tutoring, help from professors, and distance-learning programs. Advice on the application process emphasizes the schools that look beyond GPA to the extracurricular activities and community involvement at which many average students excel. Quelling both students’ and parents’ fears about finding a good education with a less-than-perfect academic record, this guide makes it clear that it is always possible. This updated edition has new data on student life, financial aid and costs, deadlines, and admissions information.